It’s 40 Days since Prophet Iesou appeared on his Cloud. Today a large 7.0+ Earthquake shook Anchorage Alaska Violently and the map in the Iesou Quake Prophecy showed a quake line running right through Anchorage. Below is the article we did when a unique set of triple 6.0+ quakes hit days after he warned off the coast of Canada on the same quake line. Believe what you will people, but large historic quakes are hitting exactly where prophet Iesou warned. Yesterday we reported on a YouTube Video Prophecy just released from THE PROPHET IESOU (JESUS). 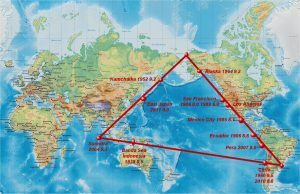 The map in his video is of the Triangle of Fire, it has a line that runs right through Los Angeles, Portland and Seattle and then through the Pacific Ocean and through Alaska. Early this morning UTC Time, three very large quakes hit just Northwest of Seattle and west of Vancouver Island in Canada where the line of the Triangle of Fire runs through. So IESOU (JESUS) was spot on issuing his Prophecy Video on GREAT QUAKES hitting the Triangle of Fire about 36 hours from when the event just hit. The first quakes was 6.6 Magnitude then the main quake was 6.8 and the third quake was 6.5. It was a classic three quake event, a fore shock, the main event and then the after shock. A 6.8 range magnitude quake is a rare seismic event, around 14 or so 7.0+ quakes occur each year all over the planet, so for three such large quakes to strike so close to a quake warning showing the area hit can be called a historic prophecy. This 6.8 Quake was the largest quake to hit Earth in almost a month since the Indonesian Quake of 7.5 Magnitude struck almost a month ago. It killed over 1,000 people and produced a historic Tsunami. There have only been 20 Quakes this year all over the planet this large. Below is our article we released yesterday about PROPHET IESOU CHRISTOU (JESUS CHRIST) and his GREAT QUAKES PROPHECY. We have confirmed that these 3 Large Quakes are indeed HISTORIC in that there is no record in past quakes of 3 Quakes over 6.5 Magnitude hitting within 23km of each other within 43 minutes. It’s as if an EMP weapon was used perhaps by higher intelligence to verify the Prophecy of IESOU CHRISTOU. In the past week conspiracy circles were buzzing about how all NASA Space Telescopes have gone OFF LINE. Is there a fleet of UFO’s surrounding our solar system to enforce the EDICT of IESOU CHRISTOU? Is this Earth now under attack from higher intelligence that wants all nuclear power plants and weapons turned off? These 3 Large Quakes today were indeed HISTORIC SEISMIC EVENTS. Were they an attack upon the Earth to show the POWER that higher intelligence has in regards to being able to create seismic events at will? Is IESOU CHRISTOU a Prophet or is he the LEADER of a group of higher intelligence beings here to help save humanity from it’s own technology. If an asteroid hits earth in the Atlantic Ocean in the 6km range, the wave would cover the Appalachian Mountains on the east coast of the USA. It would destroy many nuclear reactors and repeat the Fukushima Disaster many times over and destroy all life on this earth. We do not know what caused these 3 Great Quakes that were indeed historic, all we know is how they occurred so close to each other in distance and time makes them unique seismic events. This information coupled with the way all NASA Space Telescopes went dark in the past two weeks and how recently President Trump has been rallying for a US Space Force shows something historic is indeed happening. Is it an ACT OF GOD or just a race of beings that perhaps seeded this Earth and who are now making an attempt to help humanity get rid of our dangerous nuclear technology. Some are saying JESUS (IESOU in Greek Gospels) has arrived on a Cloud and is warning the World that a series of GREAT EARTHQUAKES is about to occur. He has shown exactly where GOD ALMIGHTY will shake the earth in his video about the TRIANGLE OF FIRE. IESOU CHRISTOU .com and IESOU .cloud are the two new sites that have popped up recently heralding how IESOU (JESUS) has arrived on his CLOUD. IESOU CHRISTOU is indeed the oldest written form of Jesus Christ as it was the name first recorded by Apostles of Jesus in the ancient Greek New Testaments. IESOU says his name is pronounced YAH SHUU which is considered by many Greek Christians to be the true name of Jesus. IESOU or YAH SHUU says GOD is LORD GOD ALMIGHTY (El Shaddai) and his name is ‘HAYAH (AHYH) which is indeed the only name given to Moses in Exodus the famous I AM is I AM and IESOU says it should be translated as ‘HAYAH is ‘HAYAH. IESOU has also proclaimed that two so-called Mandela Effects involving the bible are real supernatural events. The first one is how the word Messiah no longer exists in many top bibles and except for only two verses in Daniel calling the King of Babylon (Cyrus) the Messiah in only King James bibles the word has been totally erased. The famous Lord’s Prayer given by Jesus in Matthew has also been supernaturally changed says IESOU CHRISTOU in that the word TRESPASSES has been removed and replaced with debts. IESOU has condemned the Vatican calling it PURE EVIL. Can it be the spirit of IESOU (Jesus) walks the earth and is about to shake the Earth as the Great Prophets warned he would. This is a Video by IESOU CHRISTOU introducing himself to the world recently. This is the first Video of IESOU CHRISTOU stating LOVE IS THE ANSWER. When the next GREAT QUAKE occurs, if it hits one of the 3 Quake Lines that forms the TRIANGLE OF FIRE, then perhaps IESOU CHRISTOU and his movement will become viral and change the world. IESOU has condemned all Nuclear Technology from Power Plants to bombs. He he has COMMANDED that Jews, Christians and Muslims are to UNITE. The TRIANGLE OF FIRE is a real phenomena since it contradicts modern earthquake theory as to earthquakes cannot be predicted. 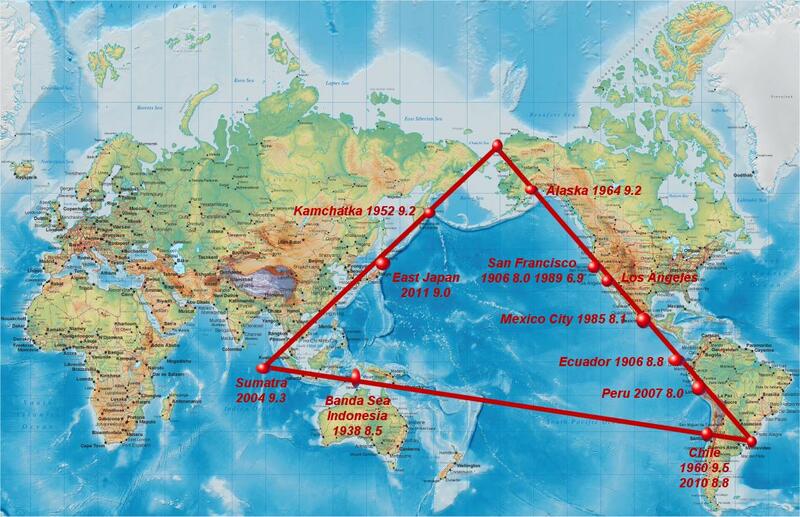 Yet research of this phenomena shows over 95% of all GREAT QUAKES the past 120 years has indeed occurred on only three quake lines that are aligned to ancient solstice monuments. So while Science has yet to proclaim the TRIANGLE OF FIRE is a real phenomena, IESOU CHRISTOU has proclaimed it is THE SIGN the Prophets warned of, control of great quakes are controlled by a higher intelligence or GOD as most humans understand it. This is the famous TRIANGLE OF FIRE is you live near the three lines that form it, you should flee those areas as IESOU is saying historic GREAT QUAKES will now hit one after the other on the lines.